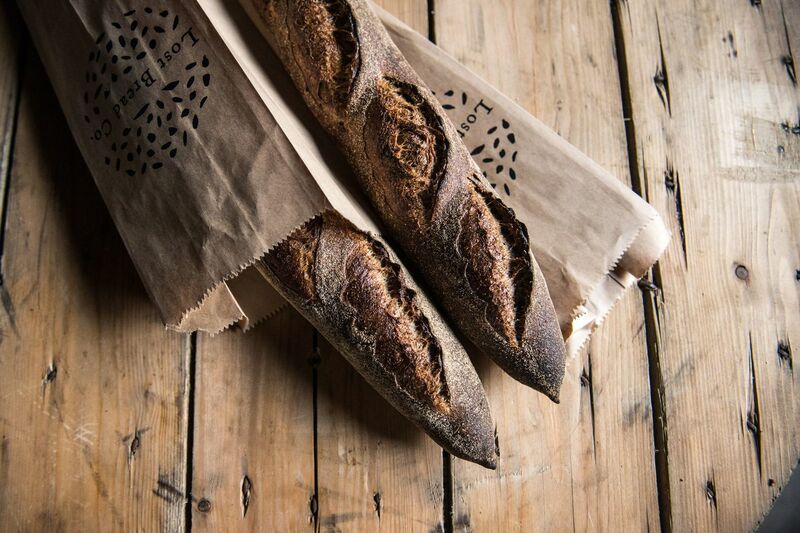 Lost Bread Co.'s newly launched grain share program includes items like this burnt-barley baguette, as well as pastries, fresh pastas, and other ready-to-eat and ready-to-use foods. As the clock struck noon on a snowy Friday afternoon, Alex Bois, the James Beard Award-nominated baker behind Lost Bread Co., gathered with six staff members at a table inside the bakery’s Fishtown headquarters. They divided a big pot of hot chocolate, almost as thick and rich as pudding, between mugs before diving into a discussion of the malty beverage’s secret ingredient: buckwheat. The nutty whole grain is the star of next month’s Lost Bread Co. Grain Share, a new program that focuses on a different regionally grown grain each month. As with a CSA, the grain share allows customers to sign up and receive special products — such as extra-creamy cocoa mix — on a monthly basis. “The monotony of bread-baking for wholesale can get tiring, but this presents a bright spot where we’re encouraged to try new things, to fail, to push our boundaries — it’s a really special environment,” said production manager Sam Degennaro, one of the bakers contributing to the new program. Three different packages — fresh, pantry, and hands-on — give grain-share customers options. The pantry package focuses on ingredients that can be stored for future use, such as whole, cracked, or flaked grains as well as fresh-milled flours, premade mixes, shelf-stable items like granola, and other surprises (think specialty mustard or miso). Those enrolled in the hands-on package partake in a monthly workshop to discover ways to cook with each month’s featured grain. January’s session, set for the evening of Thursday, Jan. 24, will bring together just over a dozen food enthusiasts and culinary experts from Lost Bread and elsewhere. As a group, they’ll talk about barley and its role in fermented products, like miso and beer, before getting their hands dirty making pizza dough. In February, Lost Bread Co.'s new Grain Share program will feature buckwheat (right), followed by emmer (left) in March. Customers can sign up for one or any combination of the packages, each priced at $50 per month. Those who opt for all three will receive a $120 deal, along with a plus-one ticket for a guest to attend the workshop. Subscriptions can be purchased on a month-to-month basis or for the whole year; they can be stopped, paused, or passed along to a friend at any time. For Bois’ staff, the grain share offers a creative outlet. Every baker is invited to whip up recipes and present them at monthly taste-test meetings. They give each other honest critiques to fine-tune what eventually will constitute the lineup for the next month’s grain share. Lost Bread Co. owner Alex Bois (center) takes a sip of an Old Fashioned made with bourbon that was steeped with toasted buckwheat, as the staff discuss flavor components of the bourbon. During Friday afternoon’s tasting session, Degennaro presented an Old Fashioned she made using bourbon steeped with toasted buckwheat. After the first sip, and without hesitation, several of her coworkers splashed some into their malted-buckwheat hot chocolate. In addition to drinks, Lost Bread staff sampled a Swiss chard-cheddar-mushroom tart, a buttery coffee cake, a fudge-like brownie, Linzer cookies filled with Concord grape jam, salted-pretzel cookies, kabocha-stuffed pierogi, flaky kouign-amanns, and toasted-grain salad with mushrooms and caramelized onions — all featuring buckwheat. After a few tweaks, many of the items from the feast will show up in February’s grain-share packages. Emmer, an ancient form of wheat, will be March’s featured grain, followed by crops like einkorn, spelt, corn, sorghum, and oats. All of the grains are sourced from Mid-Atlantic growers, with a vast majority coming from Pennsylvania farms. Each grain-share package includes a monthly 'zine with historical background on the month’s grain, recipes, and hand-drawn illustrations. Once enrolled, grain share customers can pick up packages at Lost Bread Co.’s Kensington warehouse (1313 N. Howard St.) or at Primal Supply Meats in South Philadelphia (1538 E. Passyunk Ave.). Current pickup dates fall around mid-month, but Lost Bread Co. plans to shift the schedule to the first Sunday or Monday of the month beginning in March. Pickup locations will expand as demand increases. Packages can be reserved online at lostbreadco.com.